Film Review: ‘Mr. 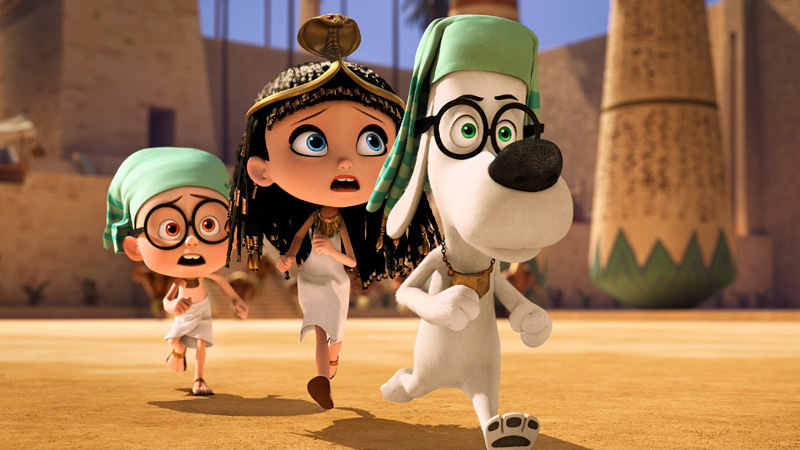 Peabody and Sherman’!! When I was a little girl, I would snuggle up on the couch with my dad and watch reruns of his favorite cartoon, Rocky and Bullwinkle. He would tell me all about “moose and squirrel”, Boris and Natasha, George of the Jungle, and Dudley Do-Right… but the one I loved best was Peabody’s Improbable History. It was clever, snarky, educational in the worst way, and full of horribly great puns (which I am still a sucker for). I was worried when going to see the new DreamWorks (Shrek, How to train your Dragon) movie Mr. Peabody and Sherman, that it would not live up to the kitschy cool of the original 5 minute shorts. I was pleasantly surprised to find a smart, fun movie that kept the cool (and the horribly great puns). In this revamp from director Rob Minkoff (‘The Lion King‘), Sherman (Max Charles) begins a new school, he gets off on the wrong foot with his classmate, Penny (Ariel Winter), (and by wrong foot I mean- she is horrible and I hated her when the movie started out) and he bites her. The school is forced to report the incident to the movie equivalent of C.P.S. 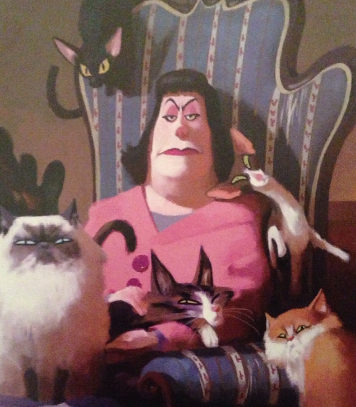 and Ms. Grunion (Allison Janney), the most horrible woman in a pink sweater set since Delores Umbridge (‘Harry Potter‘), threatens to take Sherman away from Mr. Peabody (Ty Burrell), a talking dog with a bow-tie and glasses who adopted Sherman. Mr. Peabody invites Penny, and her parents, over for dinner to try and repair the damage and impress Ms. Grunion in order to keep custody of his son. Sherman in trying to get the bully off of his back/impress the girl and uses Peabody’s time machine, the WayBack, to take her to meet George Washington, in order to prove to her that the whole cherry tree thing is just a lot of hoopla. Chaos ensues- and includes some great characters, especially Stanley Tucci as da Vinci and Patrick Warburton as Agememnon. Mel Brooks as Einstein was a sweet surprise. The movie flows at a comfortable pace and only once did I find myself thinking that I wish I wore a watch so I could know what time it was. There are a lot of history/geography puns, for those looking for the old school humor, and quite a few poop jokes for the younger crowd. The story is wrapped sweetly with lessons learned and friendships made. I enjoyed my time going into the past and getting to relive my childhood, and I can’t wait to take my children to see this so they can learn to love it in the future. ‘Mr Peabody and Sherman‘ is back in a big way and I expect it to make decent money at t he box office. P.S. – Don’t forget to check out our interview with director Rob Minkoff by CLICKING HERE. It was a lot of fun. This entry was posted on Thursday, March 6th, 2014 at 12:30 pm	and is filed under Film, News. You can follow any responses to this entry through the RSS 2.0 feed. You can skip to the end and leave a response. Pinging is currently not allowed. « See The First Image from ‘The Human Centipede 3’! !